Everyone has a dream, no matter what the age. Making those dreams come true is the challenge. When a group of pals who get together weekly to jam get the opportunity of a lifetime to play a gig in the Catskills, you get a musical that all audiences should relate to you. The Gig, with a book and score by Douglas Cohen, follows these six buddies up the mountains as their dreams and relationships are tested. Led by dreamer Marty, six aging friends with careers that are not performing respond to an ad in the paper to be a house band for a resort in the Catskills. It’s only when they arrive that they discover this resort getaway isn’t exactly paradise. And neither is the situation when they are forced to replace one of their own due to cancer, adding a new energy to the mix. As things don’t go quite exactly to plan, their friendships are truly tested as they ponder whether pursing their dream was worth it. Cohen’s The Gig is a throwback to the past with a message about not giving up on your dreams and the value of friendship. Yet the sentimental story doesn’t always land. As we watch Cohen’s characters bright in the eye doing what they love, The Gig is a success. Yet when Cohen strays away from the basic, The Gig begins to layer in too much fluff material. The characters are a bit wishy washy in their decisions and intentions, having a change of heart scene by scene. Some of their choices appear to be created just to cause conflict and dramatic tension. The largest example of fluff material are the characters Lucy and Donna, played faultlessly by Kate Fahrner and Dee Roscioli. Their only purpose in this world is sing Cohen’s music beautifully and to instantly fall for Arthur and Gil just to have a love plotline. But The Gig’s natural love story about these men’s love for their music is more than enough to fill the love quota. Despite the setbacks in the book, Cohen’s jazzy score is fresh and invigorating. The Gig employs a top notch cast led by Larry Cahn as Marty, Doug Eskew as Marshall, and Nick Gaswirth as Arthur. Their conviction and passion for their characters were lovely to watch. Kate Fahrner and Gaswirth had wonderful chemistry during their budding romance, yet the plotline still felt out of place, halting the main story. Stephen Berger as sleazy resort owner Abe and Donna Vivino as has been diva Miss Ricki Valentine added the right amount of hilarity to the mix. Led by NYMF directing veteran Igor Goldin, the overall production served the venue magnificently. The simplicity in staging and design was cohesive, allowing the audience to tap into their imagination. 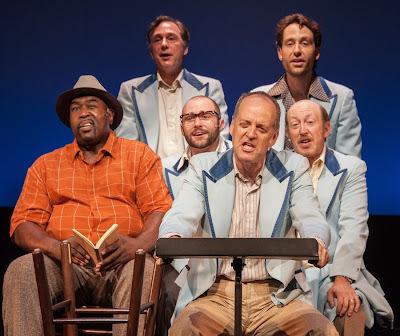 Yet, the theatricality of no instruments is clever musically, showcasing Cohen and the casts skills, but for a musical about men who dream of playing music, you kind of miss seeing the instruments. The Gig has a great universal theme but it doesn’t quite translate to all audiences the way it wants to. The weight and gravity play an important aspect in the characters’ lives but with too many plotlines to follow, the stakes are lowered. Cohen’s music is truly the selling point of this show.